Beautifully Decorated 3 Bedroom/2bathroom Condo With Great View Of The Golf Course. Nicely Decorated Condo Overlooking Lake Cumberland. Near 18 Hole Golf Course. Lake Cumberland touches Clinton, Laurel, McCreary, Pulaski, Russell, and Wayne Counties in Kentucky. Impounded from the Cumberland River, this reservoir was created when the United States Army Corps of Engineers constructed the Wolf Creek Dam in 1952. Lake homes for rent on Lake Cumberland offer access to this beautiful lake, which is the 9th largest in the United States. Measuring 101 miles long, Lake Cumberland sports a surface area of 65,530 acres. With so much room on the water, there is a place for everyone to fish. Many of Kentucky's fishing records have been set on this lake, including the record for brown trout (21 pounds), rainbow trout (14 pounds 6 ounces), sturgeon (36 pounds 8 ounces), walleye (21 pounds 8 ounces), and striped bass (58 pounds 4 ounces). Other fish found near Lake Cumberland lake properties for rent include lake trout and sauger. The best fishing months on lake Cumberland are April, May, September, and October. Fishing isn’t the only water activity that lake house renters enjoy. Local marinas like Beaver Creek Marina, Jamestown Marina, and Wolf Creek Marina offer places to dock your boat, as well as watercraft to rent. You can even strap a Flyboard water pack to your back and soar 30 feet above the surface of the water. If you prefer to spend your time on the shore, there are 1,255 miles of shoreline to be explored. On the north side of the lake, you'll find Lake Cumberland State Resort Park, covering 3,117 acres of wilderness. In addition to outdoor sports like volleyball and disc golf, park visitors can take guided horse tours or wander through extensive hiking trails—all only a short distance from their lakefront properties. Golf is a longstanding tradition in Kentucky, and there are a number of excellent courses that are easily accessible from a Lake Cumberland lake-view cabin. Dale Hollow Lake Golf Course is part of the Kentucky State Golf Trail. It has won many awards, including a four-star rating from Golf Digest. Woodson Bend Resort offers an 18-hole championship golf course designed by Lee Trevino and Dave Bennett. Both of these courses are nestled in the natural beauty surrounding Lake Cumberland. If you are interested in living on a Lake Cumberland area golf course, visit GolfHomes.com for information and listings. Lake Cumberland is one of the largest man-made bodies of water east of the Mississippi River. A vacationer's paradise, Lake Cumberland covers over 63,000 acres, with an abundance of commercial marinas, launching ramps, motels, restaurants, boat rentals, Lake Cumberland State Resort Park and a variety of campsites. Its waters touch over 1,255 miles of shoreline with an average depth of 90 feet. Nearby cities: Lexington- 1 hour, Cincinnati- 2.5 hr., Louisville 1.5 hr. For the fishing enthusiast there are trophy size stripers and state records held here for brown and rainbow trout and walleye. Lake Cumberland hosted the 1995 and 1996 Walleye "Quest" Championship. Walleye fishermen invaded Lake Cumberland in search of that $50,000 walleye. With 50,250 acres, Lake Cumberland has an abundance of largemouth, smallmouth, white and Kentucky bass, bluegill, crappie, rockfish, and walleye. 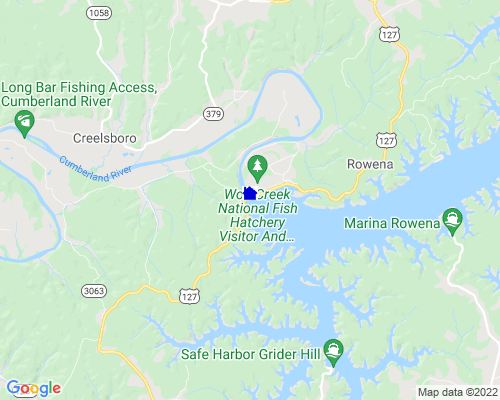 Lake Cumberland State Resort Park is one of the finest fishing and pleasure boating areas in the Eastern United States. The resort is a haven for large deer herds and raccoon populations. Lake Cumberland also features the only indoor pool complex in the park system. A glass-backed elevator, atrium, exercise room, and hot tub add a pampering touch to Lure Lodge! The park's 147-site campground offers utility hookups, two central service buildings with showers and rest rooms, laundry facilities, two dump stations, and a grocery nearby.